Look to these amazing DIY Christmas wreaths for inspiration to create your own unique front door holiday decor! In a search for the perfect DIY Christmas wreaths to adorn your front door? If you want to get the holiday spirit going, then having one will indeed be a good idea. One of my favorites is this fruity and floral entry that is an eye-catching alternative to the traditional red-white-and-green motifs. I think it has everything that represents the season. I make fall wreaths too, but I think after Halloween, it's time to switch it up to make it a little more festive in keeping up with the occasion! Burlap is the stuff of my fall wreaths so I can make a simple and beautiful upgrade to reflect a minimalistic and rustic Christmas theme. It's also a great material to use for all your wreath projects so I'm sure you'll find it perfect for this holiday. What Is Burlap? It is a fabric woven from sisal fibers or jute plant with vegetable fibers. I've been making my Christmas wreath for years now. It started as a curiosity, but now, I just can't stop looking and making one each and every year. This year, I'm going for this cheap and simple twigs and sticks wreath, perfect for those on a budget. This whimsical wreath with a rustic charm looks like a burst of joy that will bring a smile to anyone's face. This minimalistic yet gorgeous entry looks both fancy and elegant. If you have 3 hours and $10 to spare you can make this stunning red felt wreath that's sure to bring the pop of color your front door needs. Deck the halls and your doors with holiday cheer, and for this, you can't go wrong with white. If you're dreaming of a White Christmas then this simple white holiday wreath will complement the look you're going for. Don't you find this Christmas wreath fluffy and adorable? Just at the sight of red and green, anyone will feel the holiday cheer. 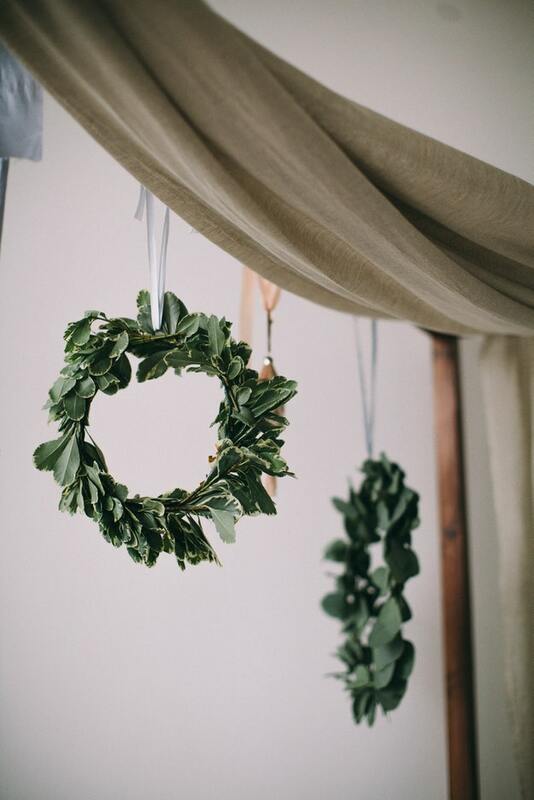 This one may look intimidating to make, but you'll find yourself properly inspired once you find out how this fresh and natural wreath was made. With scarlet red berries, pine boughs, and a good imagination, you'll be able to pull this off. Oooooh, shiny!! A little paint and some embellishment and truly go a long way. Just see how this stunning DIY leaf wreath turned out. Fresh Christmas wreath ideas are great but you can make them fancier with some metallic paint and glitter. Get creative and put your clothespins to good use this holiday season. For last minute DIY wreath ideas, this clothespin and bead wreath should be a quick and easy one. Another fabulous rustic Christmas idea. By attaching some wood slices together, you can recreate this beautiful DIY wreath. The burlap completes the look. Jell-O molds are not just for making holiday treats, and if they're ones headed for the dump, don't throw them just yet! You can also use them as a base for decorating DIY Christmas wreaths. Take this unique wreath inspiration or give it a design uniquely your own! Christmas spirit + peppermint candy = beautiful holiday wreath! Is it edible, hmmm… You may want to think about it since it will be out in the open all the time. Hang on to your old wood because you never know what amazing uses you will have for them in the future! Upcycling wood slices into a rustic wreath, for instance, is one. With a little finishing and a pretty ribbon, you're done. You will have an instant Christmas wreath! Now, this is a wreath that will stand the test of time. You may need to put some time into making it, but I assure you, you'll be able to use it for years to come. Put your metalworks skill to the test or learn how to, with this DIY galvanized wreath tutorial! Now you know several ways to make DIY Christmas wreaths. So if you don't have a Christmas wreath yet, we hope you got your pick from this selection we created especially for you! This holiday season spread cheers by hanging a DIY Christmas wreath on your door and put a smile to anyone who passes by your home! Red, green, white, or burlap, which one is your top pick? I'd love to know what it is from your comments section below! Stay connected with us on Facebook, Twitter, and Instagram! Editor’s Note: This post was originally published on November 8, 2016, and has been updated for quality and relevancy.